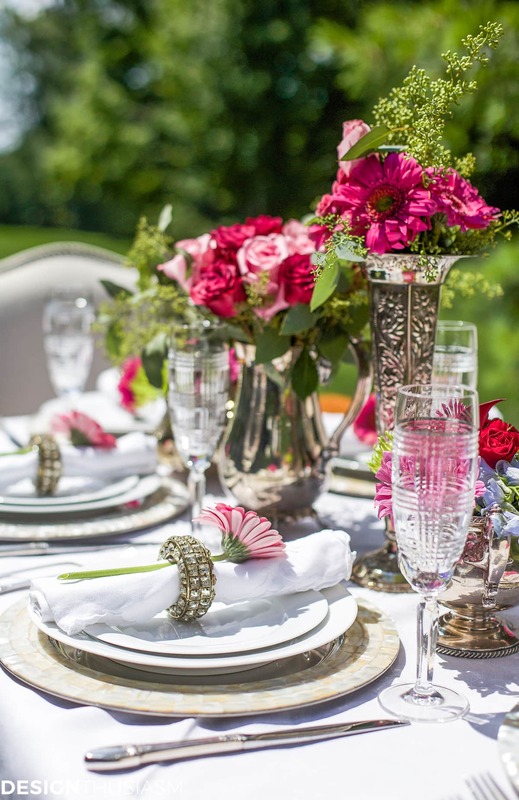 Do you ever look at beautiful table settings and then think, “yeah but, I only have one set of plain white dishes”? Well, don’t despair! As it turns out, crisp white dishes are the ‘little black dress’ of tableware. Accessorize them and they can go anywhere. 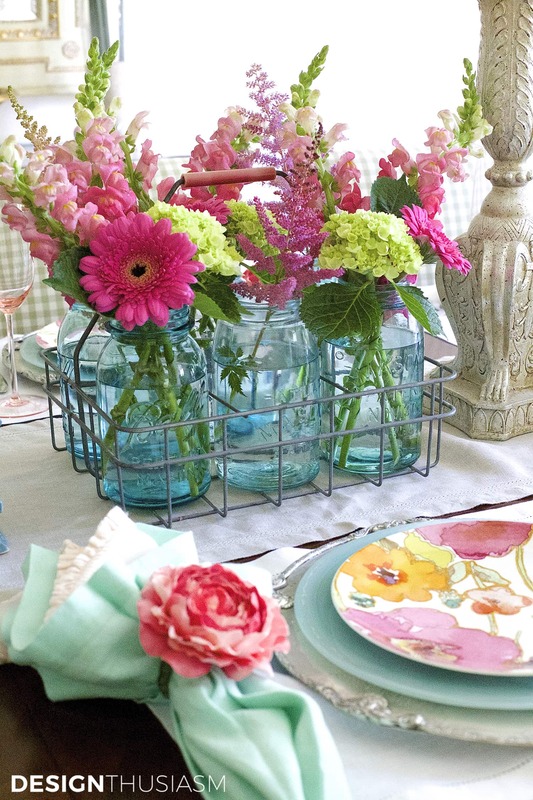 The only thing providing color on this vibrant table is fresh flowers. Remove the flowers and you have essentially an all white table. With simple white plates, you can use almost any charger. Here I’ve used mother-of-pearl mosaic chargers for a bit of textured interest. 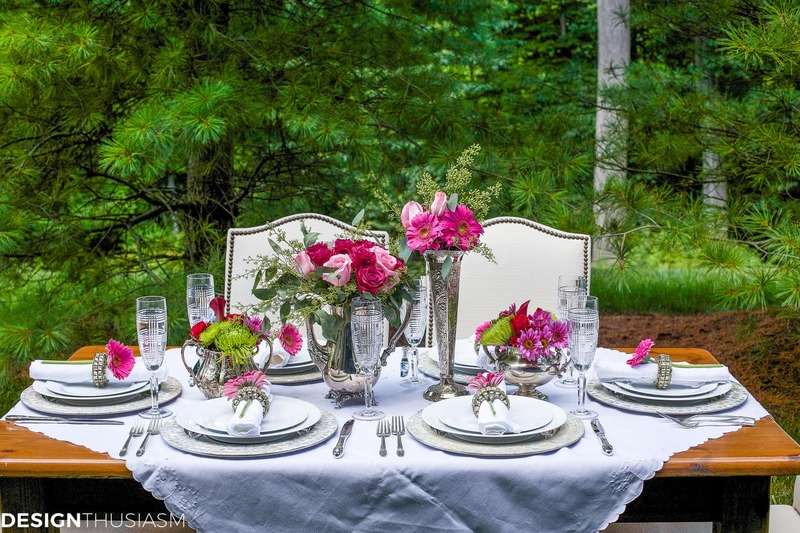 But what really defines this table and takes it out of the ordinary is the mix of florals. 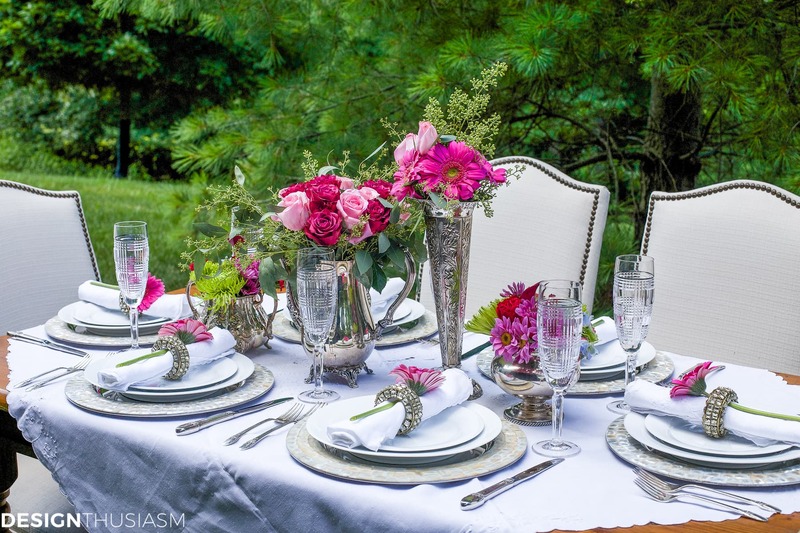 I chose to keep the tableware very understated and let the florals do all the heavy lifting. 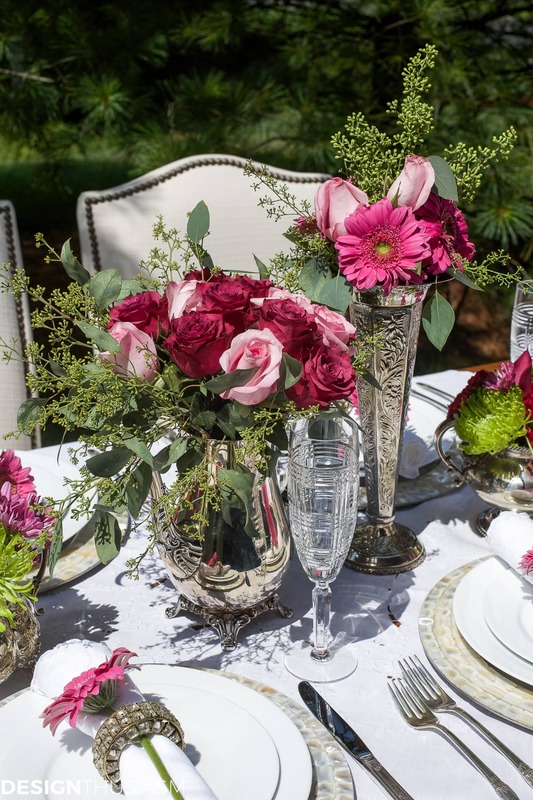 Multiple bouquets in varied heights give this tablescape its personality and work perfectly in this garden setting. 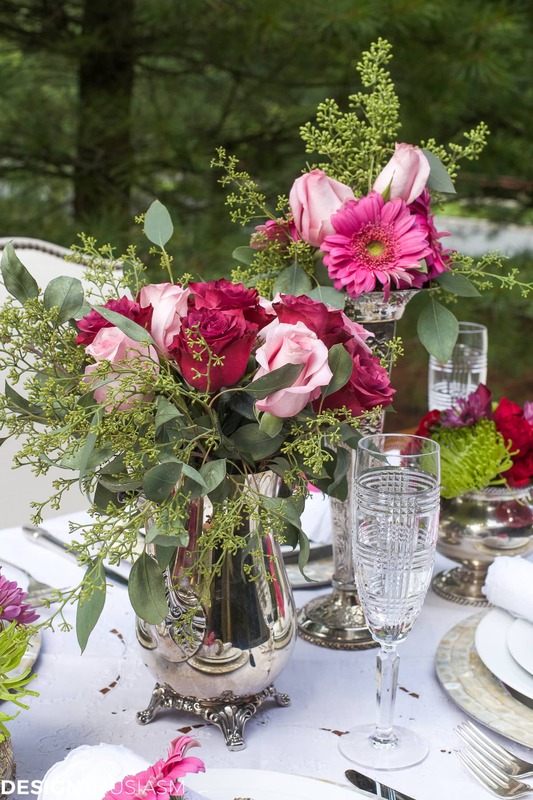 I selected a range of vintage silver vases to present the arrangements. The silver pieces add a note of shimmer without taking away from the tonal underpinning of this tableau. 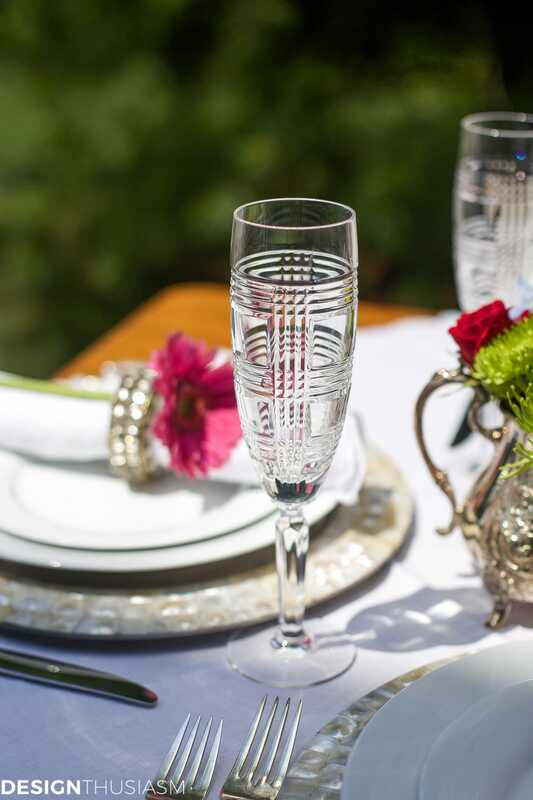 Cut crystal champagne flutes serve a similar purpose, adding elegance without being distracting. 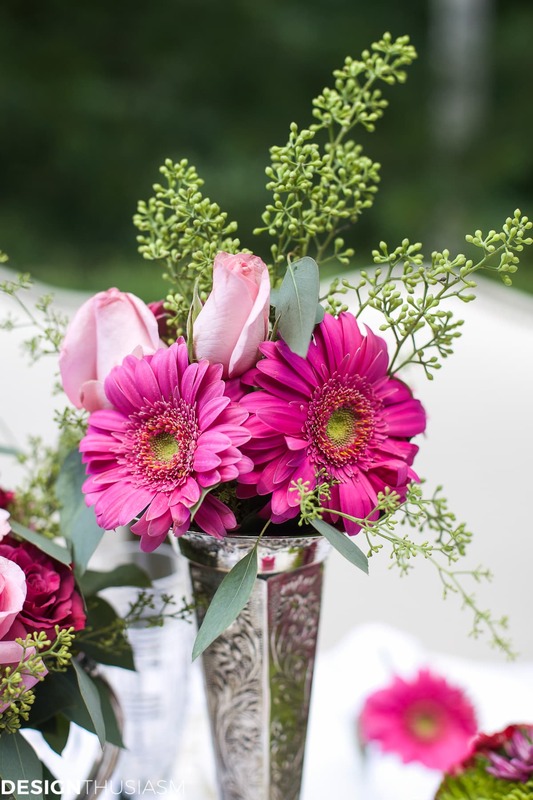 The white embroidered napkins are gathered in a crystal ring, but the pink gerber daisies tucked inside take it up a notch. 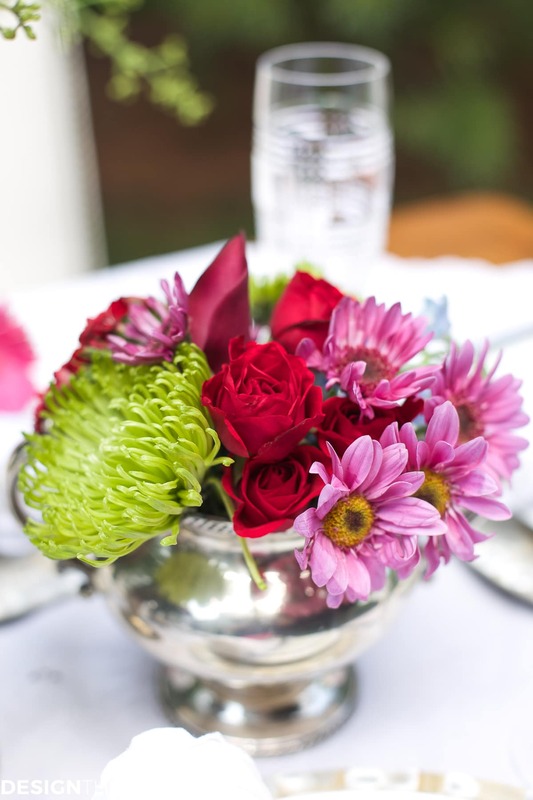 To get the same effect you can use any white napkins with various metal rings, as it’s the flower that makes the real statement. I used a small embroidered tablecloth thrown askew, but again, any vintage white cloth will do. 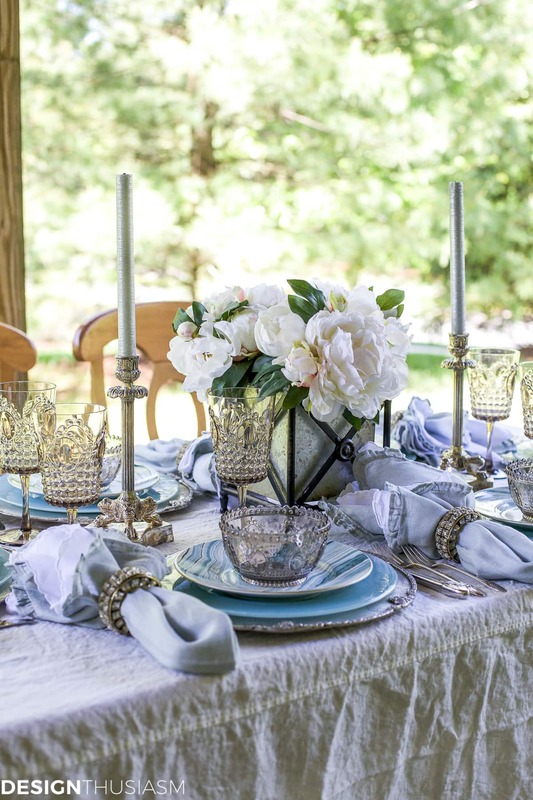 If you think not owning formal china is preventing you from setting an elegant table, think again. 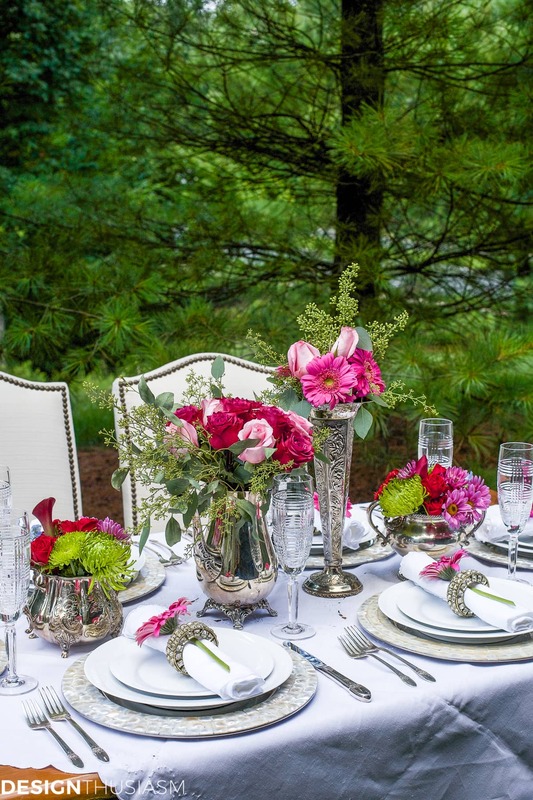 With simple white dishes and a mix of gorgeous florals, your table settings can be quite exceptional! 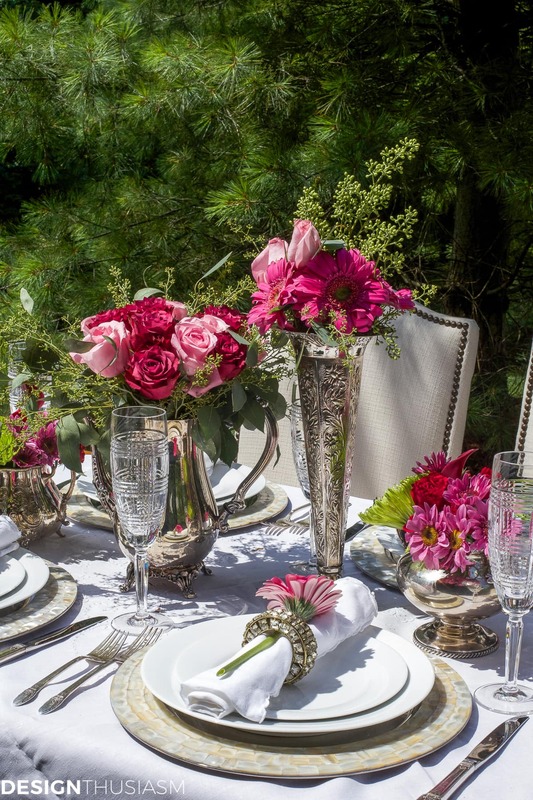 This table setting is elegant! 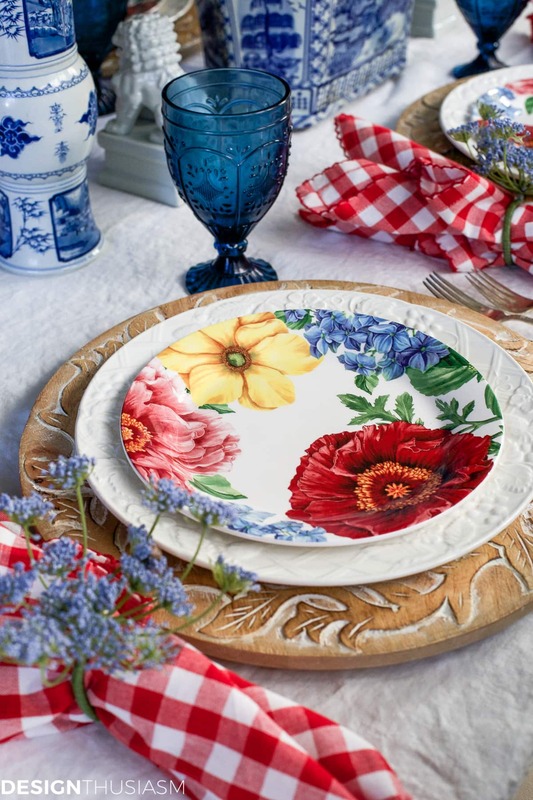 I like the use of white plates and then the stunning colors of the fresh flowers. Is there a source to find faux SEEDED Eucalyptus? 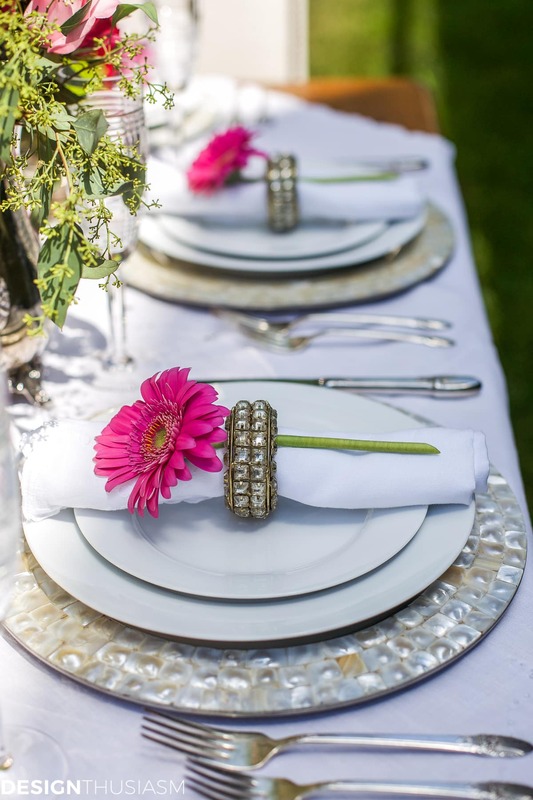 Hi Lory ~ I like your juxtaposition of crystal stemware, blingy napkin rings, silver tea service pressed into service to hold flowers and the mosaic chargers set on an outside wooden table with Mother Nature as the fresh, green background! How should I dress if I’m invited, LOL?? Summer elegance for sure..Although, I would need to hire help..If only to carry those gorgeous chairs. Beautiful beyond reproach!!!! The flowers are just perfect! I love the brilliant colors with the silver pieces and against the white dishes. Perfection! That was a really helpful post. Thanks, Lory! Lory, you don’t do “ordinary.” This table is gorgeous. Those flowers are . . . exquisite. I love that you selected various shades of pink to add more complexity to the design. 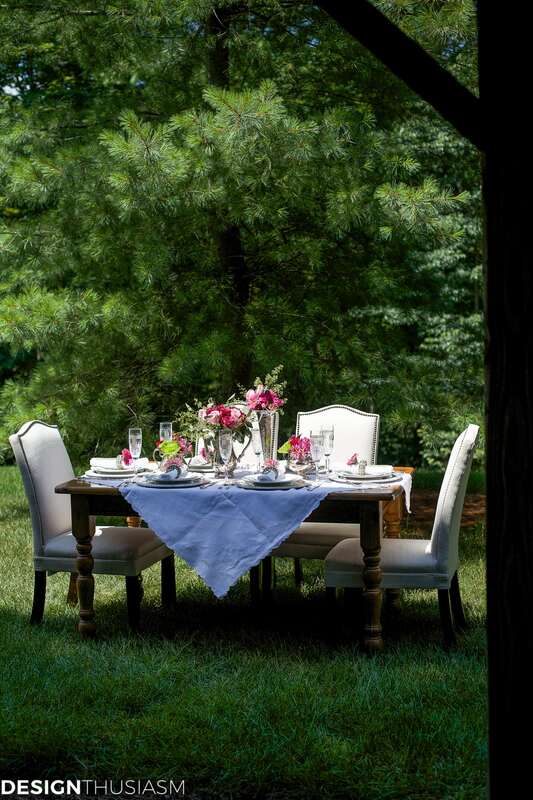 This table looks elegant, and effortless – the kind of thing that you might pull together at the last minute, and then run into your cutting garden and pick some flowers for the table. (Ha! Well, that’s the illusion, anyway; we know how long it really does take to put something like this together.). You’ve inspired me to try something like this for the summer, but I don’t even want to see the word “Fall” yet. Not ready for it by a long shot. Your table is beautiful! We are so blessed to have such lovely choices. White and pink, white and blue or orchid. Even white and red in July, is a happy 4th choice!